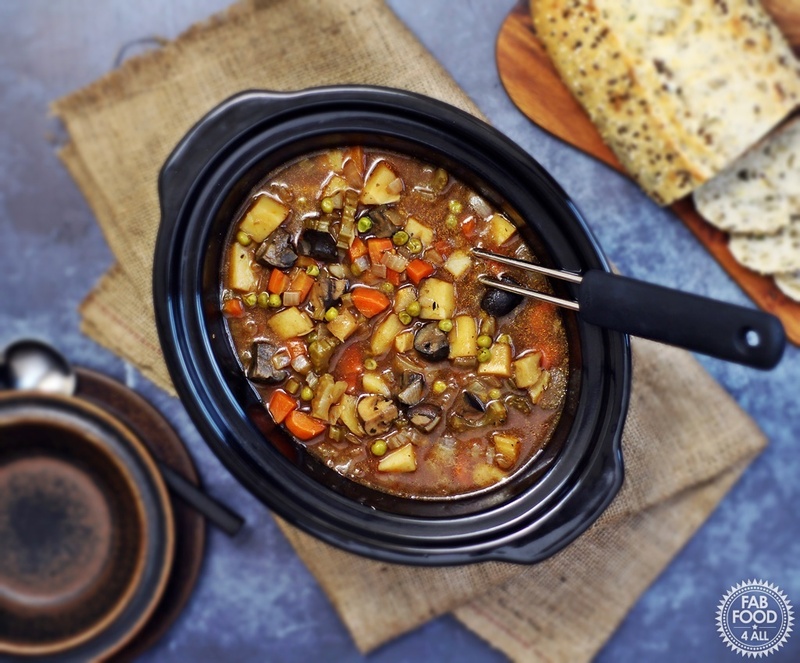 You are here: Home / Vegan / Easy Slow Cooker Vegan Stew – tangy & fat-free! 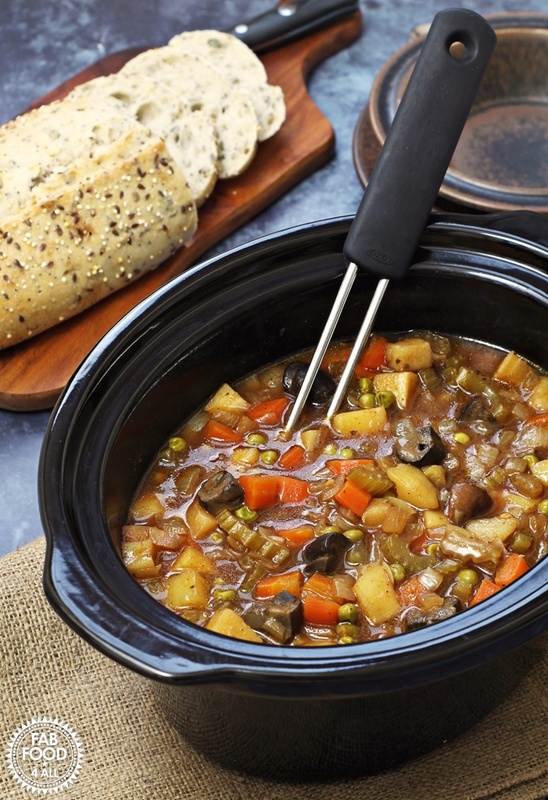 Today I’m bringing you an Easy Slow Cooker Vegan Stew. As many of you know my daughter is vegetarian and this week she managed to persuade my hubby to eat more vegetarian food. So I thought I’d adapt a Beef Stew with Worcestershire Sauce recipe that my hubby once concocted in the slow cooker. So this is really a Beefless Stew! But first I had a few dilemmas to solve! What’s a good replacement for beef in a vegan recipe? Well that was a no brainer, it had to be Chestnut mushrooms. They hold their shape and texture really well unlike white mushrooms and give that satisfying chew too. What’s a good vegan replacement for Worcestershire Sauce? I decided that Balsamic Vinegar and Soy Sauce would give a great depth of flavour and compliment one other perfectly with the sweet and salty notes. I wasn’t wrong and together with the Tabasco Sauce for a hint of chilli, mixed herbs and vegetable stock the flavours just jelled beautifully. 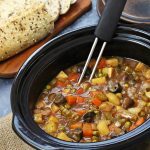 What do you serve Easy Vegan Slow Cooker Stew with? The stew is best served in a bowl along with lots of crusty bread to dip into the cooking juices or should that be broth? Or you could serve Easy Vegan Slow Cooker Stew as a side dish if like me you are catering for different diet preferences. 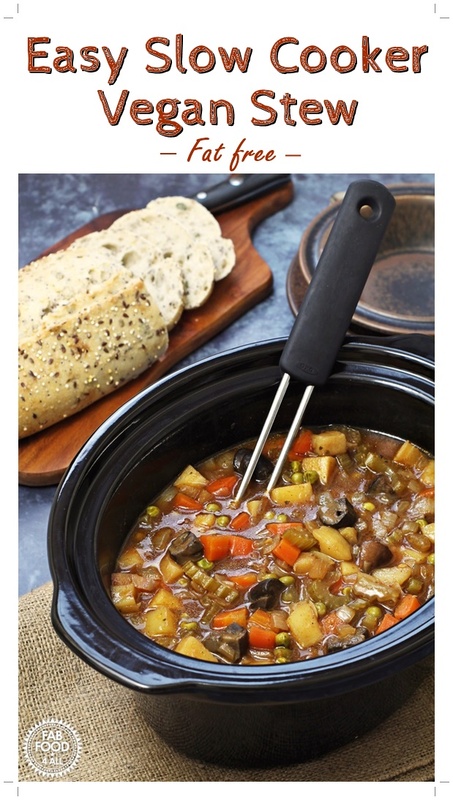 How many people does Easy Vegan Slow Cooker Stew serve? You’ll get 5 – 6 servings. As there are just 3 of us here at the moment we had this stew over 2 days and I added a can of butter beans on the second day to bulk it out. My daughter wasn’t a fan of that though and picked them all out! 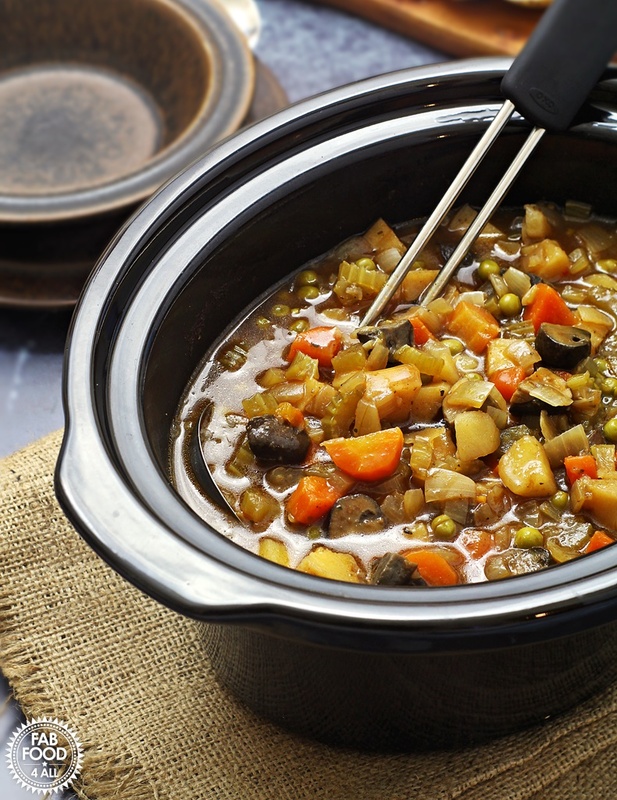 Can you use other root vegetables in Easy Vegan Slow Cooker Stew? Yes of course, the world is your oyster, another time I’d try butternut squash or any other root vegetables I happen to have! I do hope you try my Easy Vegan Slow Cooker Stew. Not only is it tangy and delicious but it’s also fat free. So if you’re on the Weight Watchers or Slimming World diet or just trying to cut down on your meat intake, then this is the recipe for you! 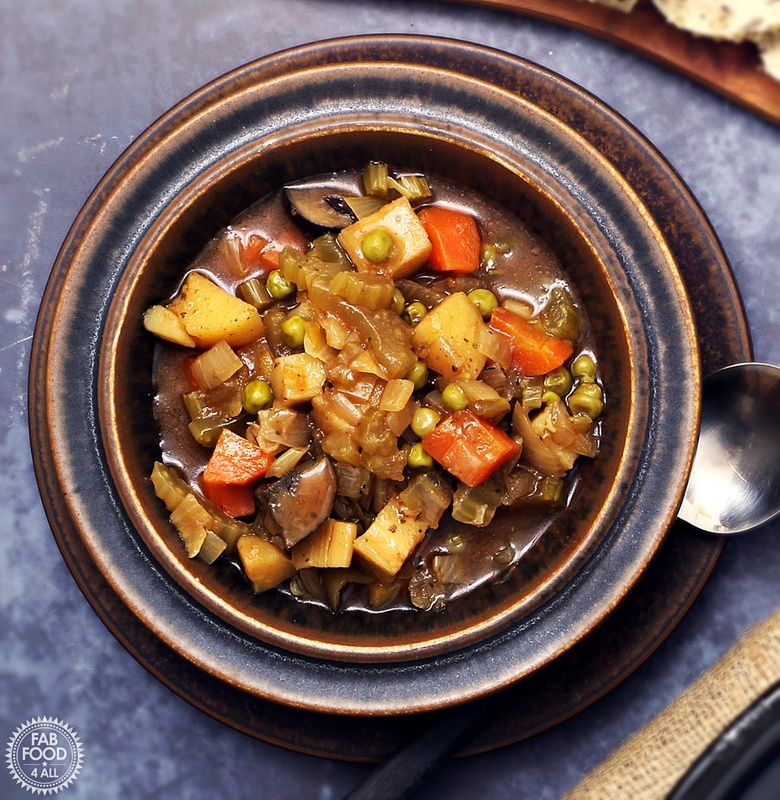 A hearty vegan root vegetable stew enhanced by Chestnut mushrooms and peas with a tangy, tasty broth best mopped up with crusty bread. Would also make a great side dish too! Roughly chop all the vegetables (except frozen peas) and place in a large bowl. Stir in the flour, herbs and pepper. To the stock add and mix in the Balsamic vinegar, soy sauce, tabasco sauce and tomato puree. Set the slow cooker for 3.5 hrs on high or 5.5 hrs on low. Stir in the frozen peas and cook until the vegetables are tender (about another ½ hour). Serve in bowls with crusty bread for mopping up the juices! Previous Post: « Tomato, Carrot and Dill Soup – creamy, garlicky & delicious! I do love a good stew at this time of year and this looks delicious. I really should use my slow cooker more, but it’s stock at the back of the cupboard and always seems too much of a faff to get out. Hi. I don’t have a slow cooker. Could I make this as a casserole in the oven and if so how? Many thanks. It looks lovely. It sounds really tasty and I’m sure the chestnut mushrooms were a great replacement for the beef. I’d also love it with the butterbeans too!